(As Featured in May2014 Nourish Magazine) I just love how these Pears soak up the wonderful flavours of Lemongrass and Ginger tea. Served with cheats coconut ice cream, they are heavenly. Plus the poaching liquid makes for a tasty drink that can be enjoyed hot or cold. My homemade Peking duck post was featured on Freshly Pressed, receiving thousands of hits in less than 24 hours – thank you for noticing me and for reading. When I didn’t think the day could get any better, I received a note from Restaurant Balzac that I have won wine matching for their 9 course degustation menu – thank you again, I look forward to the experience! To celebrate, I decided to treat myself to a dessert that’s becoming quite an obsession of mine: lemongrass and ginger tea poached pears with (a cheats version of) coconut ice cream. That’s right, no churning or machines required. Simplicity at its best. It’s Autumn. Pears are at their peak. And I just love how they soak up the wonderful flavours of whatever exotic herbs and spices you choose to infuse them with. 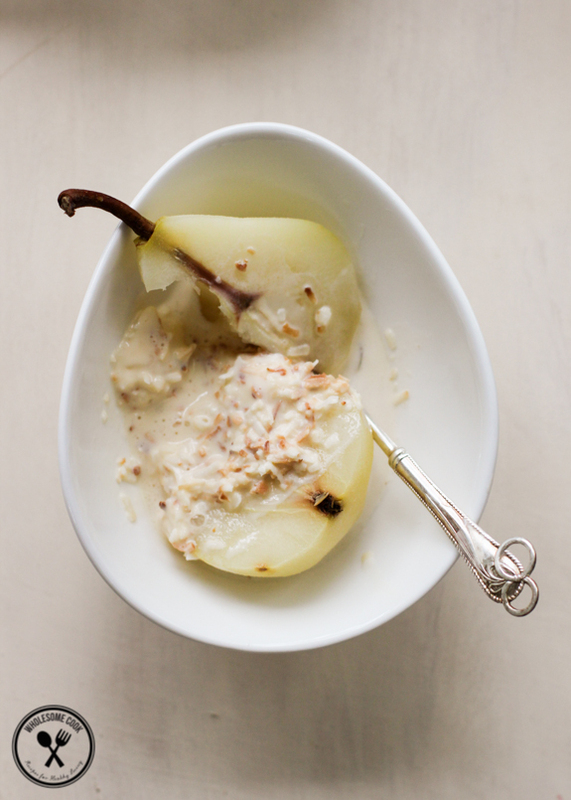 You can also use tinned pears if you live in those parts of the world where Autum is still months away. If you enjoy warm Asian flavours such as can be found in light mango curries for instance, you will appreciate the combination of lemongrass, ginger and coconut in this Autumn inspired dessert. The nice thing about the cheats no-churn ice cream is that you don't need a machine to make it. Better still, if you are completely out of time, you can simply use canned pears for this dessert for the ultimate in shortcuts. They won't have the gingerly flavours, but will provide more instant gratification. 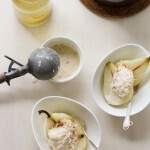 There is 15 minutes of actual cooking time involved, but the pears should rest in the poaching liquid for an hour before serving to cook through. Bring water to a boil in a large saucepan. In the meantime, peel pears, reserving the peels. Once the water is boiling, add the tea bag, pears and peelings, lime peel, chopped lemongrass and ginger. Simmer gently for 15 minutes. 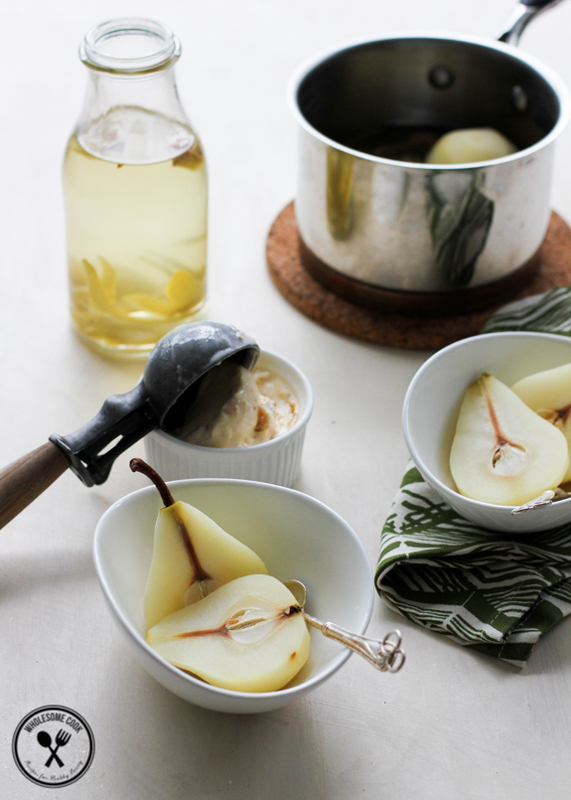 Turn off the heat, cover the saucepan and allow the pears and liquid to come to room temperature and the pears to finish poaching. To serve peas, cut them lengthways. Remove the core using a teaspoon. Arrange 1 or 2 pear halves in a serving bowl. Top with a scoop of ice cream mixed with lightly toasted coconut mixed through it. Store pears in an airtight container in the fridge. Pour poaching liquid into a jar or bottle and store in the fridge for up to 4 days. Dilute the tonic with water or drink straight up, cold or warm. You can even blend the ginger and pear peel into the liquid for an even more wholesome drink. This looks fantastic, I love coconut ice-cream! 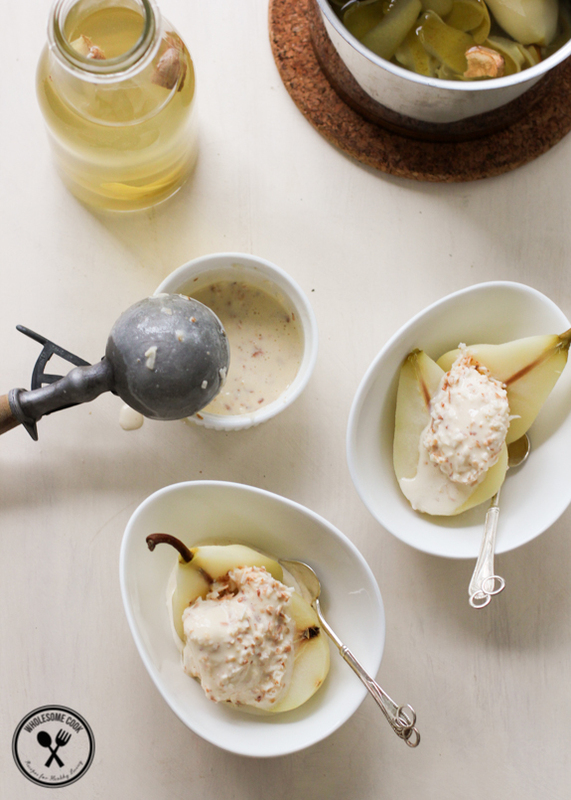 I’ve wanted to poach pears for a while, and I love the sound of the flavours you’ve used. Thanks! I’ve even plonked the pears atop chocolate ganache tarts. Amazing! Wowwww. You did it again. This look sohohohoho good! Looks delicious! I can imagine how tasty the combination of pears and coconut would be! Congratulations! No surprises that your blog is booming. It’s positively stunning and you have a greta voice! I love this cheats icecream, I’m needing a slow introduction into icecream making so this is perfect! Thank you Heidi – your comments are always so lovely and I love reading your blog too. As far as ice cream goes, I’ve thought about buying a machine, but coming up with good cheats ice cream flavours is more fun! Enjoy! Thank you! They were so yummy, especially the ice cream. Thanks Jen, and same to you! Congratulations that is wonderful news. Your blog is fabulous so well done! Looking forward to more lovely posts from you. 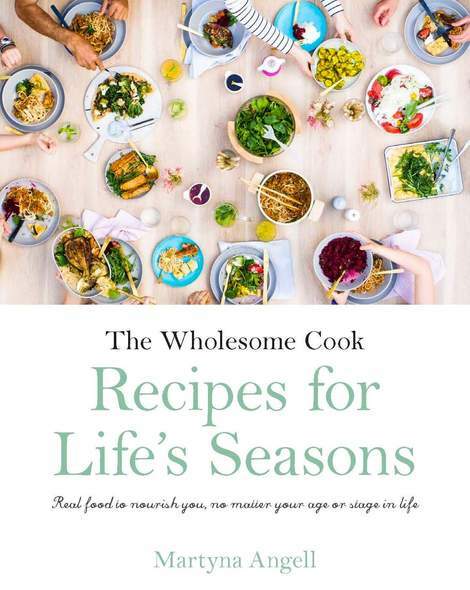 Thank you Sherilyn, and ditto – love your blog! Hence the mug cake? Hehe Thanks Sneh. It is sooo good! Yum! This recipe looks so delicious and I love your photos! Sounds absolutely sublime. Will try it sometime, thanks for sharing, love your blog. Thank you, lovely to hear that!